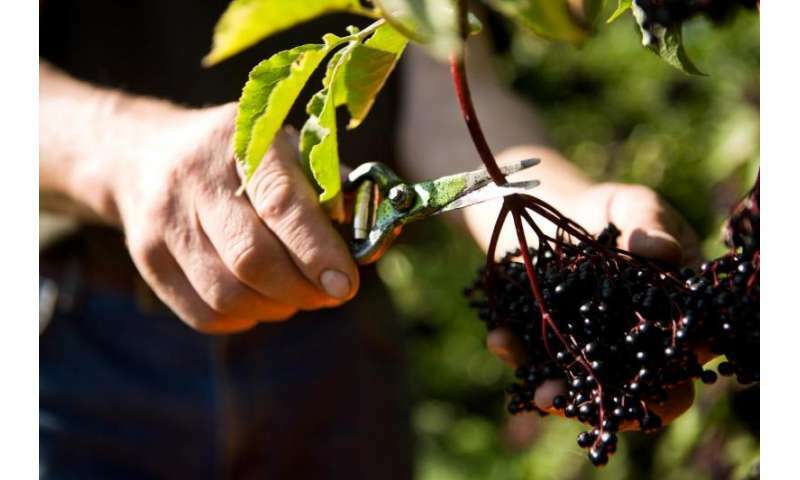 The negative health effects of international air travel are well documented but now it seems that the common elderberry can provide some relief. Associate Professor Evelin Tiralongo and Dr Shirley Wee from Griffith's Menzies Health Institute Queensland (MHIQ) have completed a clinical trial showing that an elderberry supplement can provide some protection from cold and flu-like symptoms following long-haul flights. Intercontinental air travel can be stressful and affect a passenger's physical and psychological wellbeing. Whilst jet lag and fatigue remain the best known problems, holidaymakers also often experience upper respiratory symptoms. Presenting their results at the 21st Annual International Integrative Medicine Conference in Melbourne, the research team showed how elderberry appears to reduce the duration and severity of the cold. The randomised, double-blind placebo controlled clinical trial was conducted with 312 economy class passengers travelling from Australia to an overseas destination. Cold episodes, cold duration and symptoms were recorded in a daily diary and participants also completed surveys before, during and after travel. "We found that most cold episodes occurred in the placebo group, but the difference between the placebo and active group was not significant. However, the placebo group had a significantly higher number of cold episode days, and the symptom score in the placebo group over these days was also significantly higher," says Associate Professor Tiralongo. "Complementary medicines are used by two in three Australians, thus increasing the evidence base of these medicines should be at the forefront of our efforts. It's often forgotten that the evidence for various herbal medicines is extract specific," says Associate Professor Tiralongo. The trial used capsules containing 300mg of a standardised, proprietary membrane-filtered elderberry extract which has shown to be effective in working against respiratory bacteria and influenza viruses. The Griffith study follows recent European research published in the open access journal Current Therapeutic Research which suggests that a combination of Echinacea herb and root extract supplemented with elderberry can be as effective as the conventional antiviral medicine Tamiflu for the early treatment of influenza.